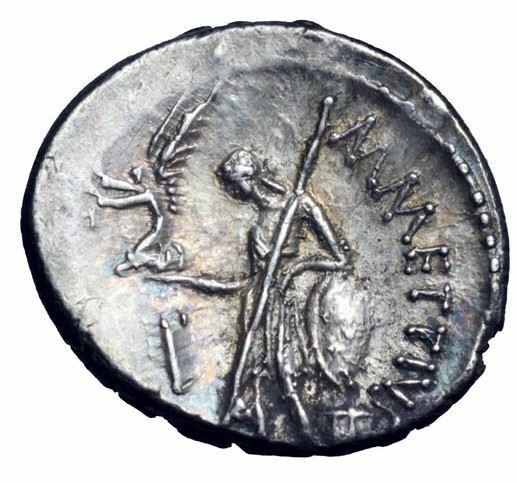 Marcus Mettius was a supporter of Julius Caesar in the 50s and 40s BC. He served as moneyer in the year 44 BC. During the first year of the Gallic Wars, Caesar sent Mettius and the Helvian Celt Gaius Valerius Troucillus as envoys to the Suebian king Ariovistus, in what was presented as a last-ditch effort to prevent a full-scale war. Instead, Ariovistus accused the two of spying and arrested them. Troucillus was chained and subjected to at least psychological torture, but Mettius seems to have received better treatment, perhaps because he had a longstanding relationship (hospitium) with the Suebian. Since Ariovistus had been declared a Friend of the Roman People (amicus populi romani) during Caesar's consulship in 59 BC, the hospitium between him and Mettius might have had to do with the diplomacy that led to the declaration of friendship. Mettius is sometimes identified as a businessman, presumably of the equestrian order; trade with the Germanic peoples at the time might have involved slaves, animals, or goods.